We survived savored another crazy week in July! My husband's parents live 1,748 miles away and we were so blessed to have them stay with us this week. Time flies too fast when spending time with family and it was hard to see them leave on Friday. The days seemed like a blur and my in-laws were so helpful during their visits. I was even able to mow the lawn in peace while Grandma played with the boys. Who would have thought lawn mowing could be so fun?! 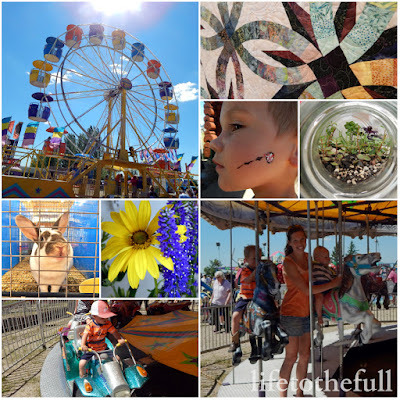 We spent Thursday at the county fair in my hometown and that was a bunch of fun jam-packed into one day. After early lunch at the fair, we toured the animal barns, exhibits and children's barn. Now E thinks we need a bunny... I have mixed feelings on that idea. E went on a bunch of rides (mainly the same 4 kiddy rides over and over and over again) and we all baked in the hot sun. Ice cream, folk music and then the drive home. The kids were asleep before we even made it out of town. I love the county fair but one fair day with small children is enough for me! 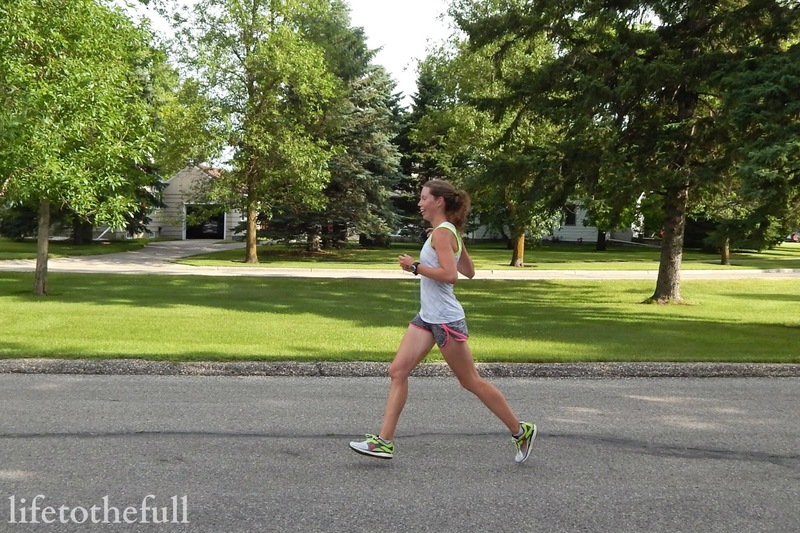 Nearly all of my marathon training this week went down at 5:30 am to beat the heat and the busy days with family. I was very thankful to actually get in all of the training runs! Every day I prayed that the Lord would give me extra energy and patience for this week—He is always faithful! I would like to think life will slow down soon but harvest is just around the corner... Might as well enjoy the rest of the summer before winter comes. Brrr.... I shiver just thinking about it! 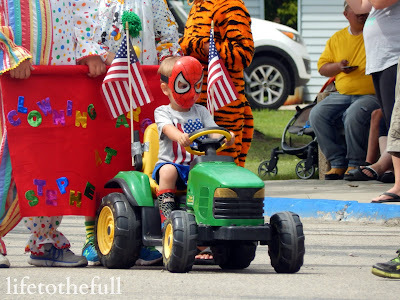 Do you enjoy any fairs in your area? Easy-Effort: 6.01 mi, 00:55 @ 09:07 pace. Speedwork: 5.5 mi, 00:43. WU, 5x1k @ 7:20, :18, :31, :14, :01, CD. No running. Made a trip to the park with Grandma and the kids; then mowed the lawn. Hot and humid! Strength: Planks series of 6 x 1:00. Tempo: 6.1 mi, 00:47. WU, 5 miles @ 7:31/mile, CD. Easy-Effort with double stroller: 3.11 mi, 00:38. 2 miles running @ 9:58, 9:32 and walked the rest with a friend. Long Run: 16 mi, 02:16 @ 08:31 avg pace. 11 miles outside after a storm went through, then 5 in the treadmill when more storm clouds were looming. Super hot and humid for this afternoon run which messed with my stomach. Morning runs are best but sick kids happen! 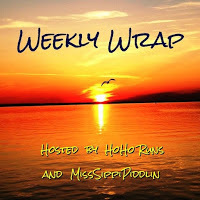 Linking up with Holly and Tricia's Weekly Wrap Up and Faith's Mommy Moments. July is CRAZY! Seriously, July has got it going on. I feel very thankful for that.... and slightly frazzled. The week itself has been rainy but the kids and I did sneak in some gardening time. 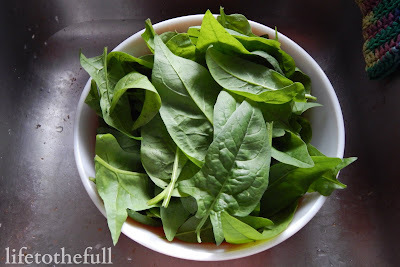 Our spinach was ready for its first harvest and the garden was a jungle in need of weeding. E said he wants to be a "master gardener" when he grows up! On Friday, we hit the road for a camping and wedding adventure and, honestly, marathon training had to go on pause. So, yes, this was a "free week" for training. With all of the wedding stuff going on and not having a super safe route to run on, I thought it was best to put things (mainly a 16-mile run) on hold for the weekend. The wedding was beautiful and truly God-centered. Marriage is under heavy attack in our country and I feel so blessed and encouraged to see godly marriages beginning and then being lived out for God's glory! The wedding weekend as a whole felt long but everything went smoothly. We didn't have any major meltdowns (that I recall), RV camping with Grandma was a blast and the kids both hung in there at the wedding dance until 10 pm. Pretty good for a one-year-old and three-year-old! Starting tomorrow, training for the Wild Hog is back on track and I want to introduce you to the FXC Butterfly Compression Socks sent to me by SLS3! Compression socks are one of my tricks for speeding up recovery after a hard/long effort. They increase blood flow and help my post-long run lead legs return to their more lively normal state. I wear my compression socks on running days and on non-running days (I'm actually wearing them as I write this!). The fit is nice and snug plus the nylon/spandex material is very breathable. Don't you love the butterfly design?! This compression sock line comes in some wild colors, too. Might as well keep it fun! Check them out! The FXC Butterfly Compression Socks by SLS3 are available on Amazon for $29.90 (as of 7/14/16). Do you use compression clothing for recovery or during workouts? Easy-Effort 7 mi, 01:02 @ 08:51 avg pace. Strength: Planks, hip hikes, leg raises, bridges. And "ball wars" in the basement with the toddlers (which means throwing every ball we have back and forth across room). Packing for our camping/wedding trip. I took the kids out for a run before loading up the van and leaving on our camping weekend! Rehearsal dinner for the wedding was that night followed by the groom's supper. We ALL slept well that night! I decided to skip the long run this weekend and just enjoy the morning playing with Grandma (my mom) and the kids while Daddy was away for wedding party pictures. We were off to the wedding that evening and then the dance. It was another long day but very fun! Headed back home and resumed normal life. The Taste and See devotional is written by respected author and theologian, John Piper. He has been the Pastor for Preaching and Vision at Bethlehem Baptist Church in Minneapolis, Minnesota since 1980. I really have admired his messages and writing in the past and this book certainly followed suit. In the preface of this book, Piper states, "The best writers intensify our taste of the Bible, and especially for God himself." He was referring to John Edwards' effect on his life and I find that to be true of this book as well. Through the sharing of experiences, anecdotes and references to Scripture, Taste and See allows the reader to savor God's omnipotence, the beauty of His Word and the sweetness of His promises. The Taste and See 125-day devotional is available for purchase as a hardcover, paperback and ebook. This past week felt extraordinarily long even though it was "short" with the 4th of July on Monday. Lots of fun but I'm okay with the week being over and a new one beginning. One surprise for the week was that I raced a 5k on Saturday! The original plan was to walk/run the 1-mile with our 3 year old but he ditched me to ride in the Kiddie Parade later that day instead. For the first time in 3 years, my husband was able to be home for our town's yearly festival! 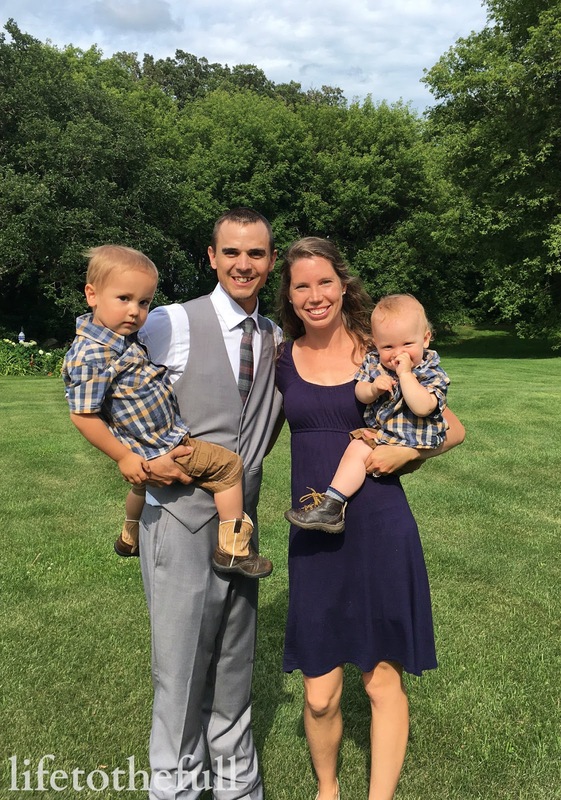 It was great to enjoy the weekend with him; he cheered me on in the race and I was able to race without the double stroller. Having him here with the kids, Grandma and I was the best. Here goes the world's shortest race recap: I had no plan except to run hard and spend most of the 3.1 miles in the anaerobic pain cave. The morning was a little warm and humid (for MN) and I was very thankful for the early start of the race. My official finish time was 20:55 and that was a new 5k PR for me! Some day I would like to make my way to the 19's but that goal will have to wait for another year. I have one more race left for the year and that's the marathon at the end of September. Hills w/ double stroller: 6.25 mi, 00:56 @ 08:58 avg pace. First day of Wild Hog training on the hilly bike trail near our campground! Warm and humid but the trails were beautiful. I ran with the double stroller "half loaded" because E road in the kid seat on my mom's bike. 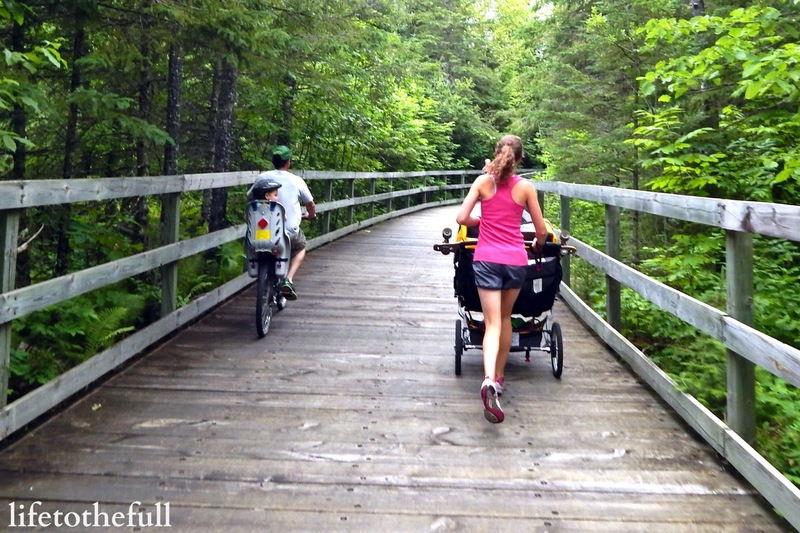 Easy-Effort w/ double stroller: 3.5 mi, 00:32 @ 09:11 avg pace. "Ran" errands with the kids. Bank, grocery store, lumberyard. No success in our quest to find a toddler-sized fishing rod! Three loads of laundry, sandbox playing and a tractor ride. No running for me. Tempo w/ double stroller: 6.06 mi, 00:51 with 4 miles @ 8:09/mile. Ran with the kids and then mowed the lawn before the rain came. Rest because I decided to run the Sizzler 5k! 6:30, 6:47, 6:48, 6:27 (for the last .14) followed by a mini yoga class in the grass post-race. That yoga class made me take the time to stretch! Long Run: 14 mi, 02:07 @ 09:02 avg pace. How many races are on your calendar this year? How Far Would You Run For Ice Cream? I hope you had an amazing Fourth of July! We are blessed with so much freedom in this country and it is truly something that shouldn't be taken for granted. I am proud to be an American—one Nation under God, indivisible, with liberty and justice for all! I am SO thankful to have an active family! Seriously, watching our herd fly down the bike path brought me so much joy. With three long boarders, three bikers, one jogging stroller pusher and two little passengers, we were like a mini parade. 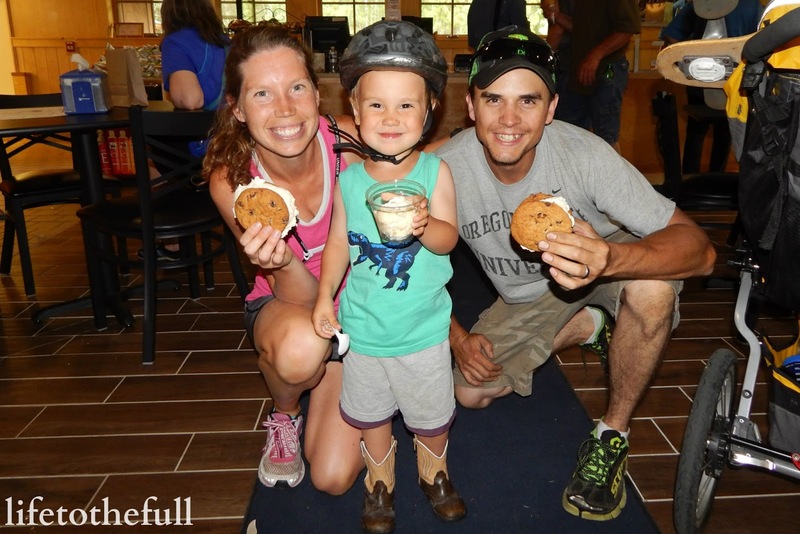 After a 10-mile long run on Saturday, we headed out on one more trek, this time to stop at the ice cream shop. We were all pretty well spent by that point but we covered the 2.6 miles there to get that ice cream. The ice cream was well worth it! So maybe our gigantic chocolate chip cookie + ice cream sandwiches were over the top but I guess we "earned them" in a way. E had his own cup of birthday cake ice cream and W slept through the whole ice cream stop. 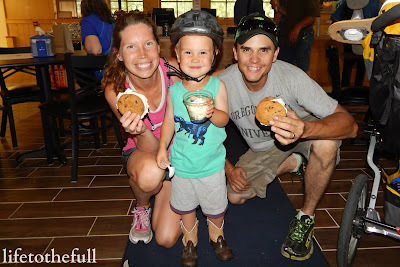 After the ice cream (yes, I ate the entire sandwich with a little help from a brother), we stopped by the Headwaters of the Mississippi River for a family photo opp and then travelled the 2.6 miles back to our campsite. Yes, I would run 5 miles after running 10 miles to get an ice cream sandwich! 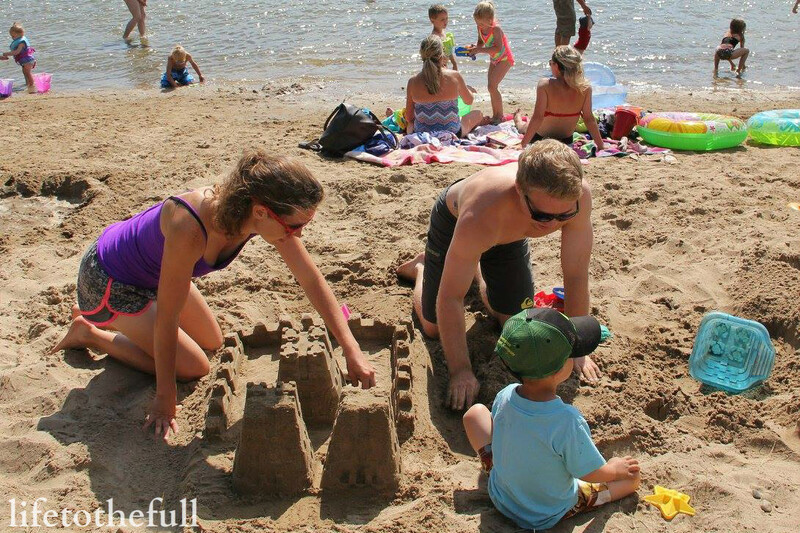 Two Quick Sidenotes: We made an epic sandcastle on the beach and there is a slight chance the adults enjoyed building it more than the toddler did. Then we let the toddlers destroy it. 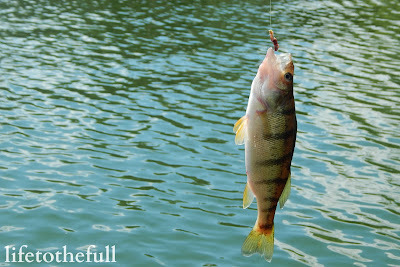 AND, while I didn't run any races this weekend, I did set a fishing PR. This is the biggest fish I have ever caught! Don't ask me how much it weighs or how long it is... I think it's a perch. 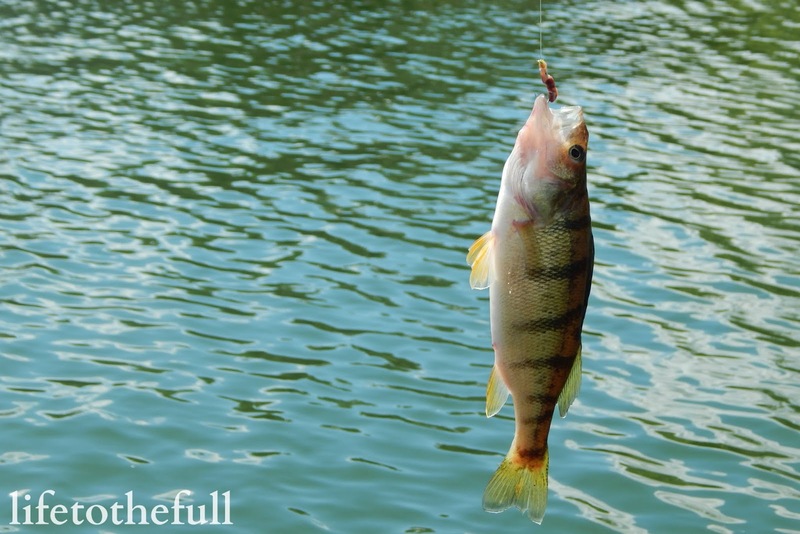 I'm definitely not a regular fisherwoman but my husband loves fishing and I was excited to actually catch something edible-sized. Any special ice cream requirements? What kind would it be? Here's to my last week of "non-training" and on to training for the Wild Hog 26.2 coming up in September! Walk: 1.75 miles to the park and the grocery store with the double stroller. Double Stroller Run: 7.01 mi, 01:01 @ 08:46 avg pace. Ran with the kids in the morning, then Teeny Ball practice after their quick nap, a tractor ride with Daddy and E's last night of swimming lessons. We ALL slept well that night! Strength: 6 x 1:00 planks and 20 reps of side leg raises. Strength: Push mowing the lawn while watching the kids. That was a first since W was born! Last run of June 2016! This morning was windy and cool. 50 degrees felt great compared to heat and humidity! Perfect race day temperature. Double Stroller Run: 1.07 mi, 00:10:54 @ 10:11 avg pace. After arriving at our family's campsite, I went for a quick run on the board walk to help the 1 year old nap. Long Run: 10.08 mi, 01:24 @ 08:21 pace. More Long Run: 5.08 mi, 00:53 @ 10:23 pace with double stroller. First 5.15 miles with double stroller and then dropped kids off at the camp site and finished the 10 miles without the stroller. Then the extra 5 long run miles were part of the ice cream run! The huge cookie ice cream sandwich was worth it. REST! Enjoying more camping fun and definitely not running.